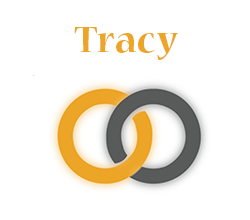 Tracy - SignOn - Connect. Practice. Retain. My name is Tracy. I am Deaf and legally blind. I am a mom to two hearing teenagers and have been married to my hearing husband for 18 years. I enjoy watching TV and movies, cooking and cross-stitching. In addition to being a SignOn Ambassador, I work part time as a bank teller, freelance writer and run my own website. I am excited to sign and practice with new learners with SignOn.